This year, Vivitar is expanding their charging products in some really cool ways. Their new line, Tap Charge, is a group of wireless Qi chargers that include sweet new features. We especially like the one that is tilted up so you can see the screen while charging, instead of laying your smart phone down. This enables you to easily view and use the phone while its charging. It also has USB ports on the front to allow you additional charging solutions while charging your phone on the main pad. There is a Bluetooth speaker with alarm clock that offers Qi charging on top. Perfect for your bedside to easily charge wirelessly without adding more devices to your night stand. And the Tap Charge Auto is the perfect accessory with Qi charging for the car. No more need to search for cords while driving, just leave the mounted charger plugged in at all times and drop you phone in whenever you need a to charge, and it's perfect for looking at your GPS on the go. The line of fabric-covered Qi chargers is really unique and a nice change from traditional black plastic chargers. You can get a single pad or a hub that charges three devices at a time. So whether more than one family member needs to charge at the same time, or if you want to charge your air pods, smart watch and phone all at the same time, you are covered. They are also coming out with a line called Snap Charge. For on the go charging, they have the best design for a portable power bank. It has a wall plug that is built in and folds away perfectly in a compact design. You can charge by a standard cord, or you can Qi charge on the top surface of the bank that uses micro suction to adhere to phone. We find this a better alternative to adding a phone case with battery charger because you can keep the case that you love and only use the add on when needed. We loved the design so much that we hope they integrate this sleek design into their charging line for other products, such as camera batteries. 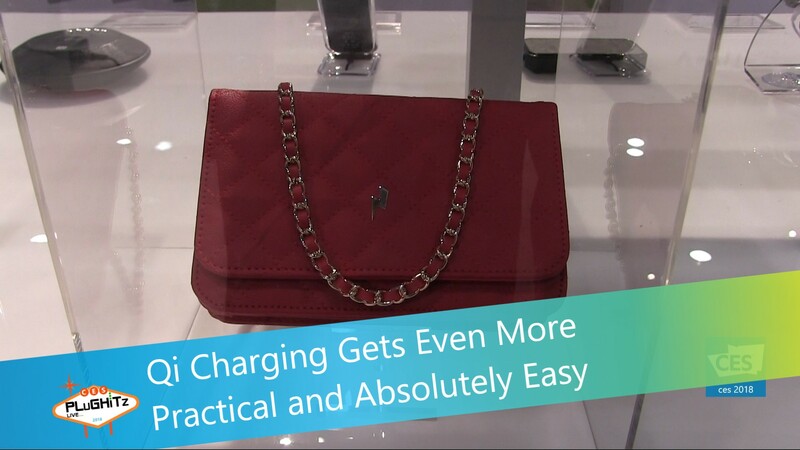 Although we were really excited about all of these new charging options, the most unique product they were showing off, by far, is a line of clutch purses that include power banks inside. They have multiple styles to choose from and can not only charge with a standard cord but they also offer Qi wireless charging. Ladies can simply lay the clutch down on the table in front of them and place their phone right on top to charge, making the phone accessible to them at all times. Prices will vary and will be between $10 and $80 USD.